These two panels are part of a large gift of 163 papers by The Wallpaper Council, Inc. The papers were most likely showroom samples as there are no complete sets of murals or maps, each of the designs was given in multiple colorways, and each panel contains a black and white photo on the reverse side showing the full scene. Smuggler’s Cove is unusual in that two panels match up to form a partial scene, where in most cases each of the panels is only a half width and are really only of use to show colors and printing technique. The Cooper Hewitt collection does not contain any full sets of mural maps printed by the Schmitz-Horning Company. This is one of five different mural maps designed by Glenn M. Shaw for Schmitz-Horning. The maps are said to be accurate and informative, with much research being done beforehand. The mural contains a lot of implied action, with the natives drumming and dancing, the sailor standing watch over treasure chests and rum, the pirate with raised pistol, and tall ships in the choppy waters. In the foreground a gull swoops down towards the water, while above the cove a mermaid frolics in the water. The full set would contain three panels and was said to be one of the largest maps lithograph-printed commercially. Each of the maps was available in nine different colorways. 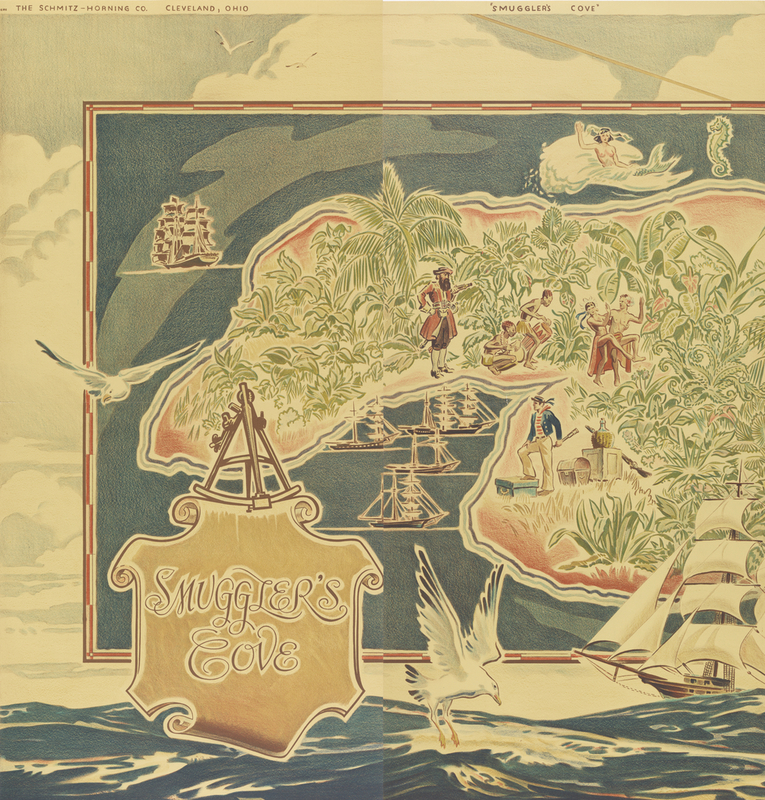 While all the map murals were designed to be instructional the ones with pirates and tales of adventure were geared towards boys. The mural maps were also appropriate for use in the den or library, while the maps showing geography and topography were also used in schools. Schmitz-Horning began producing wallpapers in 1905, and as all of their papers were lithograph-printed in oil pigments they could be wiped clean.